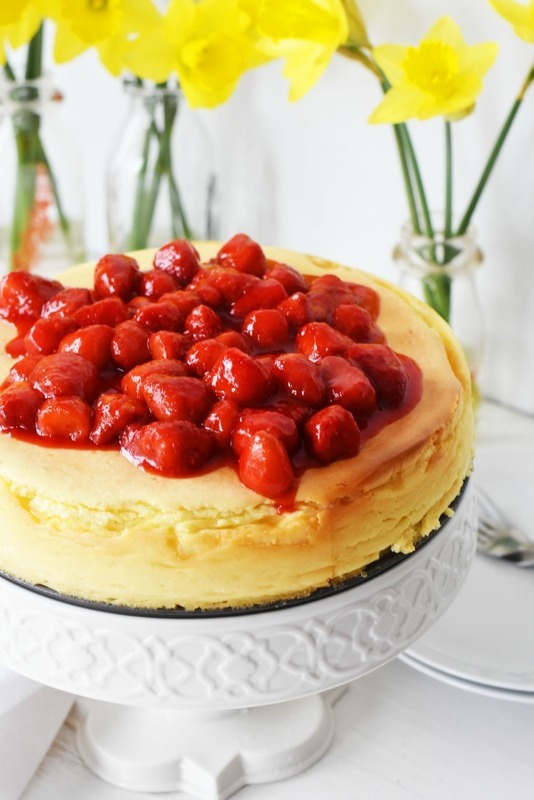 Crustless Cheesecake Recipe: Fluffy, Creamy, and Simply Amazing! Growing up, I was never a huge fan of cheesecake. My mom would buy it for holidays from the warehouse club and the assortment looked pretty but tasted blah! I was kind of naive and under the impression that all store-bought cheesecake was not that appealing. It wasn’t until last year at 31 years old that I became inspired to make my own crustless cheesecake. I have nothing against a cheesecake with a crust, but I am not a fan of graham crackers, or crackers in general. 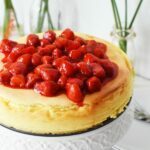 I have tried cheesecake bites with almond flour, and while they are ok, I found you can bake up a cheesecake just fine without any crust. Making a crustless cheesecake is actually easier in the long run. You do not have to worry about forming the crust or melting any butter. The only thing you do have to do is make sure your springform pan is greased very well. I bought a nifty set of spring form pans on Amazon and they come in 3 different sizes which is awesome. To prevent the pan from getting any of the waterbath water in it, I also wrap it tightly with two sheets of heavy duty aluminum foil. For the waterbath I simply use a deep walled baking sheet with about 3 cups of water in it. This helps to prevent the cheesecake from cracking. Through about 5 trial and error cheesecake runs, I also found that allowing the cheesecake to site in the oven for 3 hours after baking allows it to fall back down and not crack down the middle. Just set your timer to 60 minutes and then shut it off after one hour leaving the oven door closed. Let your cheesecake chill for at least 2-3 hours. This will help to firm it up and make it more dense. I love a plain cheesecake but recently have been topping mine with strawberry compote. I love how quick and easy strawberry compote is. You can use either use fresh or frozen berries, and skip the lime juice too. Just sub in extra water. This works well for frozen strawberries, but fresh ones fair better with the lime juice. 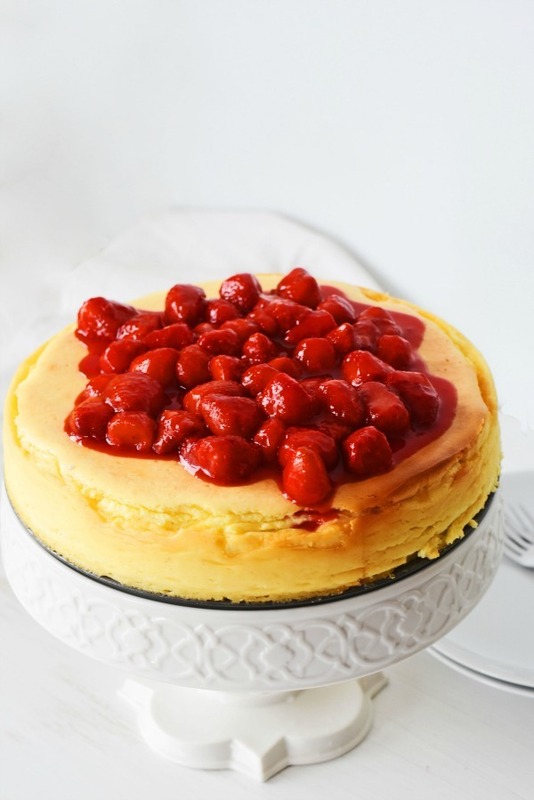 Crustless New York Style Cheesecake served with fresh strawberry compote. It's so creamy and delectable. It's our favorite cheesecake recipe! 1/4 cup all purpose flour *can sub in GF flour and make this a GF recipe. Finally, mix in the vanilla, sour cream and flour- you might want to reduce your speed to prevent the flour from creating a dust cloud. *Place foil covered spring form into a baking sheet that has water in it to create a water bath. Sprinkle in sugar and cook over low heat for 6 minutes. Berries will be slightly mushy. Allow to cool before serving to allow it to thicken. 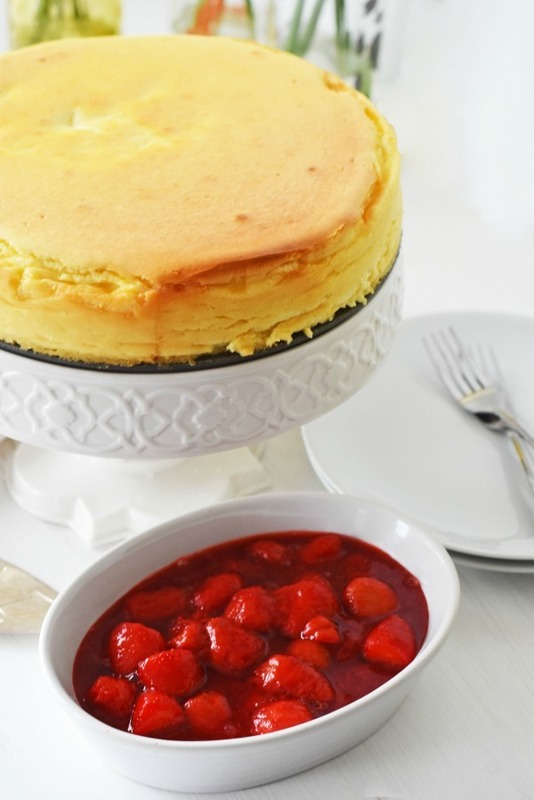 Looking for a different twist on this Amazing Crustless Cheesecake? Yum! 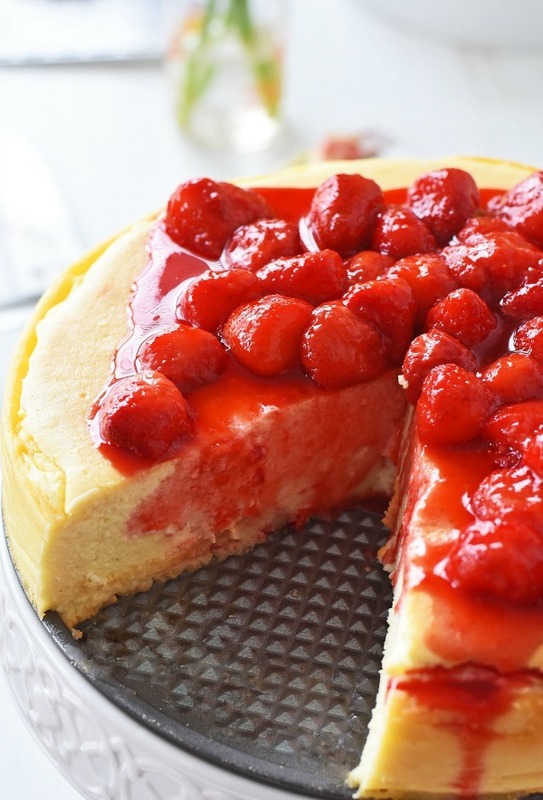 I love cheesecake and this one looks delicious! I need to make one soon, thanks for the recipe! Oh my goodness, Amy! I am not a cheesecake fan either, but that looks amazing. Saving this one for later. Yum! This is so perfect for my family. I’m the only one in the family who likes the crust, but we all like cheesecake part. This is such a cool recipe. I think I’d love cheesecake with or without crust. I’d love to try it this way. Cheesecake has got to be one of my favorite desserts. This looks really good with the strawberries topping it. I’ve never tried a crustless cheesecake. It does look delicious! I love a good cheesecake. I’ve never tried a crustless one but this sounds delicious! I’ll admit that I too don’t like cheesecake. Honestly the idea of it just churns my stomach. It shouldn’t even have the name cake in it lol! Strawberries though – LOVE those! Oh man, cheese cake is my weakness! This looks super delicious. I have never had a crustless cheesecake before. This recipe look so delicious and easy to make. I wil have to try making one for dessert this weekend. Oh my this cheesecake looks amazing. I love cheesecake but have never made a crustless one. I am excited to try this recipe soon. This looks amazing. I love that it’s crustless. I don’t usually eat the crust anyways, so this is perfect. I love cheesecake, and I love strawberries. 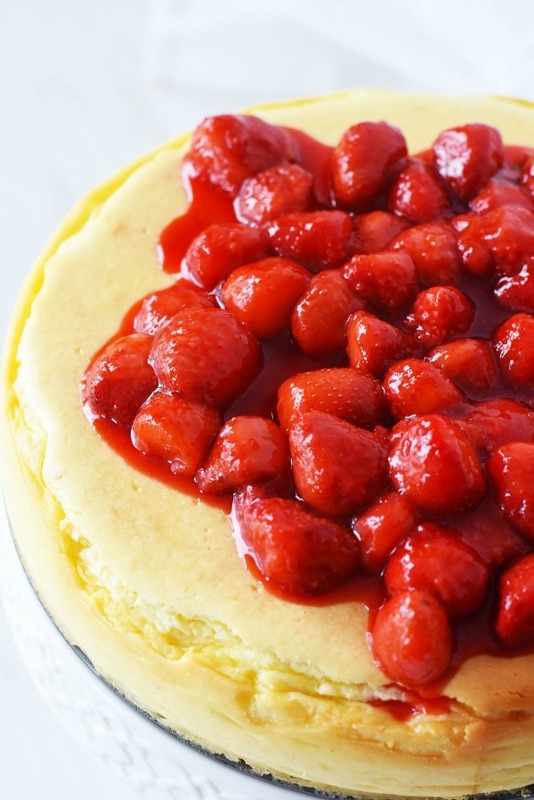 I love the idea of a crustless cheesecake with strawberries! Yum, yum! OMG! This is absolutely swoon-worthy!! This is my kind of dessert! I would love to try this! Something I know my family will enjoy! Who could not love a great cheesecake like this. The strawberries just add to the delicious looking dessert and who needs crust. i needed a crustless cheesecake but does this work in a sheet pan ? I simply adore cheesecake. I haven’t made a crustless one before. I will have to give it a try. Yumm that looks so good. Cheesecake is my favorite dessert! I need to try this. This is my kind of baking too! I never make cheesecake because of the dang crust LOL. Will be giving this a try, maybe my kids will even like it too. I LOVE cheesecake. It is the one thing my dad knows how to make, so it has a special place in my heart. My husband would love this version, too because crust is not his favorite. I’ve never tried a crustless cheesecake. I can’t wait to try it! 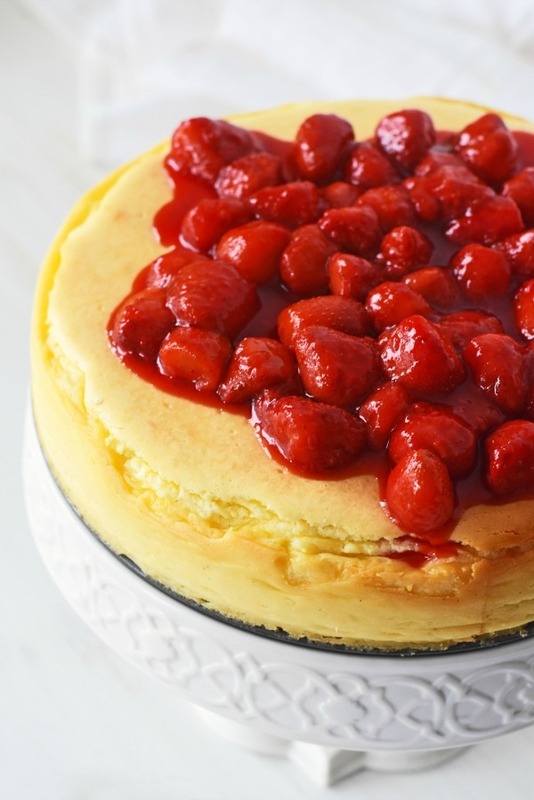 I love cheesecake – it’s one of my favorite desserts and now you have me craving some. I will admit to loving graham crackers. I’ve also made them with chocolate wafers, vanilla wafers and ginger snaps. I guess I’m easy when it comes to crust. heh. I’ve never made one without a crust – maybe I should try. I’ve also never made one in a water bath. Cheesecake has always been one of my favorite desserts. This recipe looks so decadent and creamy, I would love to sink my taste buds into this one. I love the crust on a cheesecake, but it can be such a pain to deal with. I feel that way whenever I make a pie as well. I like the idea of making one sans the crust. It’s still just as tasty. Ummm I sure wish I had a slice of that in front of me right now. I’m drooling over here! What a yummy looking cheesecake! Oh my goodness this looks to. die. for. It is the perfect spring dessert and even looks pretty enough for me to do a styled shoot around… that is… if mine turned out this gorgeous ;) Wish you lived close to the ATL, I’d totally collab with you on this! Stunning and probably just as delish! What a very delicious dessert recipe! I love cheesecakes ever since. I know my family would love this. Can’t wait to try one. This looks great!! I am also not a fan of crust at all. I always would eat just up to the crust, the filling is just so much better. I’m glad I found a recipe for a cheesecake I would actually eat!! That definitely looks so good! I love cheesecake and I also don’t mind making it at home. The crust is a nice touch but I could go on without it either way. I love love crustless cheesecake! I usually make a no bake cheesecake without crust and just add fruit as a quick yummy snack. But I so want to try this! The waterbath sounds hard, definitely looking up videos on how to do it right! I have never been a fan of cheese cakes either. But that is because I never grew with them. I tried my first at the age of 17 I think. And still, I am not a fan. But my husband loves them, so I am saving the recipe. Thank you. This looks so delicious! I am so going to make this for our friends this weekend! Amy, what a gorgeous idea! We absolutely love cheesecake! Definitely need to try these! Amy, this is really a great recipe. I will make this at the next chance i get. Amy,thank you! I made this exactly as recipe states and it was delicious. It has wonderful flavors. Five stars for this cheesecake. What a gorgeous cake! Your directions make this seem like such an easy approach, too. I would love to make this soon! Amy, this looks amazing! Thank you, I will try this right away! Amy, wow, thank you for the recipe! It looks so delicious. 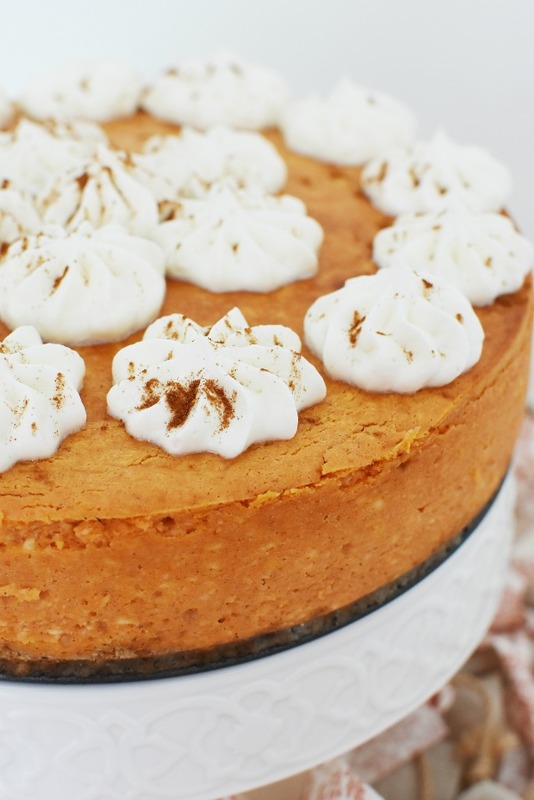 I will try to make this cheesecake tomorrow! Amy, thank you for sharing this! I have made this so many times. Everyone that tries it, loves it!